In brief: Here are the full results from this morning’s distance race at the Pacific Paddle Games in California. 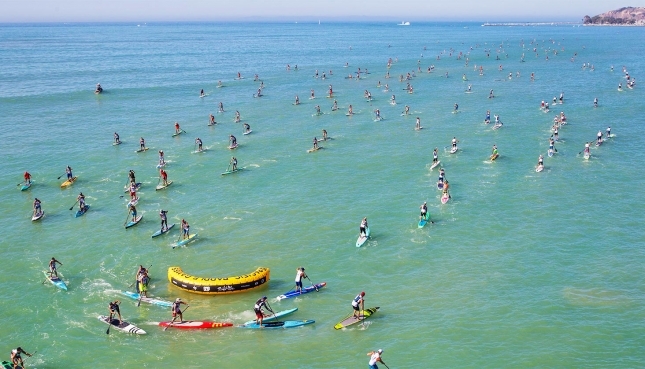 The big news is that Lincoln Dews has put himself in the box seat to win both the overall PPGs title and The Paddle League WORLD TITLE after pulling clear of arch-rival Michael Booth to claim this morning’s 40-minute long-distance-sprint race. Boothy faded to finish 5th while Titou finished strong in second place ahead of Brazilian dark horse Guilherme dos Reis. Fiona Wylde saluted in the women’s after a tight bunch surfed their way to the finish line. Fiona caught a set wave on her own and surfed to the beach to set herself up for a maiden PPGs title tomorrow. 2015/2016 PPGs champ Candice Appleby was the runner-up ahead of Shae Foudy, while early race leader Seychelle had to settle for 4th place after missing the wave that Fiona surfed to victory. Tahiti’s Keoni Sulpice took out the boys’ Pro Junior distance race, while local star Jade Howson claimed the girls’ title.